Software process improvement initiatives offer many benefits in terms of productivity, cost savings and quality. As part of these initiatives organisations undergo an assessment and then embark on a software process improvement program to improve their existing processes to meet a desired target. These programs can be improved by the use of process improvement roadmaps that are tailored to the organisation and are usually non-transferrable. Within regulated domains, such as the medical device industry, adherence to international standards must be achieved before products can be placed on the market. This work proposes the use of software process improvement roadmaps to assist organisations achieve compliance with medical device standards. These proposed roadmaps will be generic in nature to meet the requirements of the standard, but will be subsequently tailored to meet the specific requirements of an individual organisation. 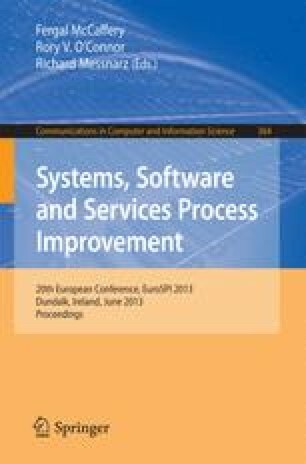 In this paper we introduce the concept of the software process improvement roadmaps for the implementation of standards and detail a methodology for developing these roadmaps.